Jazz up your holiday with this colorful favorite! 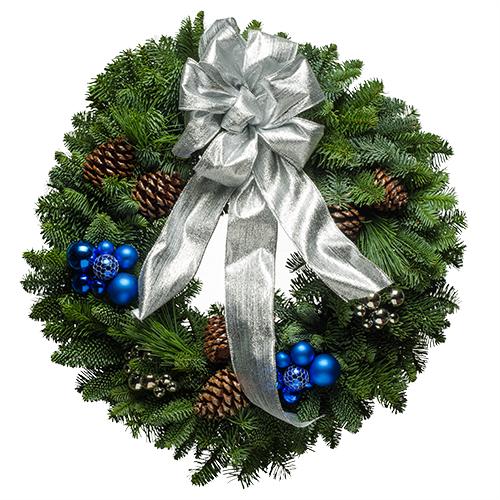 The fully decorated Christmas wreath features striking blue and silver touches that are as elegant and whimsical as Bourbon Street itself. You'll love the ornaments and shiny silver bow. Put this jazzy wreath on display, strike up the band and have yourself a Cajun little Christmas! "My Aunt Julie works for you, and every Christmas, while I was growing up, she would send us a wreath in Iowa, donned with the label "Made by Julie." That wreath was the highlight of my winter for many years. Now, 23 years later, I own my own home, and for two years, I have proudly hung a wreath "made by Julie"�I can't wait to place my order, and enjoy a small piece of Washington state all season long."